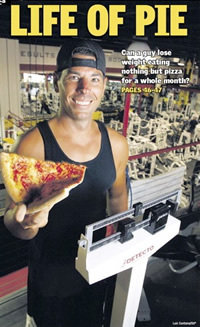 Pizza, often believed to be a dieter’s worst nightmare is now getting some credence thanks to pizza shop owner, Matt McClellan, who invented the Pizza Diet. He was tired of getting hassled at his gym for giving out pizza coupons so he decided to prove that pizza could be a healthy way to lose weight and improve overall health. He consulted a nutritionist at the beginning of his 30-day pizza diet and visited his doctor throughout the diet to document his progress. Matt ate nothing but pizza for 30 days which consisted of 8 slices consumed over a 12 hour period. His first slice was at 9 am and his last slice was at 9 pm for a total of 2500 Calories from the pizza. The pizza that he ate was made with skim milk cheese and included healthy toppings such as chicken, broccoli, avocado, pineapple, onions, peppers, and mushrooms. Sorry, meat lovers pizza wasn’t on the menu. Matt also increased his exercise level to 60 minutes a day alternating between cardio and weight training. Also, Matt didn’t change his habit of having some soda, energy drinks, or alcohol each day because he wanted to prove that pizza alone could be the healthy factor not cutting out unhealthy beverages. Matt then rode his bike from Florida to New York to show that pizza can even fuel athletes. He stopped at many pizza places along the way to promote his message. 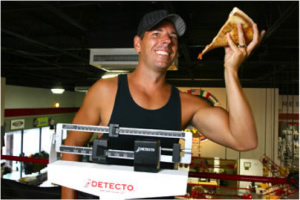 He also started a website called pizzaindustryspokesman.com, where he continues to share his mission of changing people’s perception of pizza being unhealthy junk food. Was Pizza the Magic Bullet? With the pizza diet, Matt proved that pizza can be part of a healthy diet if moderation and wise topping choices are selected. He believes that the key to any diet is portion control and that’s basically what his pizza diet is, a way to enjoy a great food, but not eat the whole pie in one go. I suspect even greater health benefits could be achieved by cutting out the soda or energy drinks and making the pizza with whole wheat crust. This is similar to Macro Counting which is becoming hugely popular because it says that dieters can eat anything as long as it fits their prescribed set of macros and total daily energy expenditure. People have been very successful with this method too and is even used by many elite athletes. Find out how many calories from pizza you could eat a day and still lose weight here. Do you think pizza is a healthy way to lose weight?